Discussion in 'Trek Tech' started by Sgt_G, Feb 3, 2019. In the original special effects, the phasers and photon torpedoes magically appeared near the bottom dome. Wow, really high tech. I'm okay with the remastered location of weapon fire (both phaser and photon torpedoes) showing origin in definitely the silver ring round the bottom dome. The ring appears to operate as a phased array phaser and photon torpedo emitter. For "forward, aft, port, midship" phasers, either they are segment portions of phased array ring, or there are more magical emitters on unknown locations around the ship. Possible locations may be associated with the port/starboard running lights (remember the black curved stripes on Pike's E), on the topside edge of the bow, and near the rear dome. The TNG Enterprise-D expanded on this technology with huge phased array phasers, but failed on the torpedo launcher. I dislike the eyeball phaser emitters and Pez dispenser torpedo launchers from the movies, and these retcons to all other designs. Keep the high tech magic. 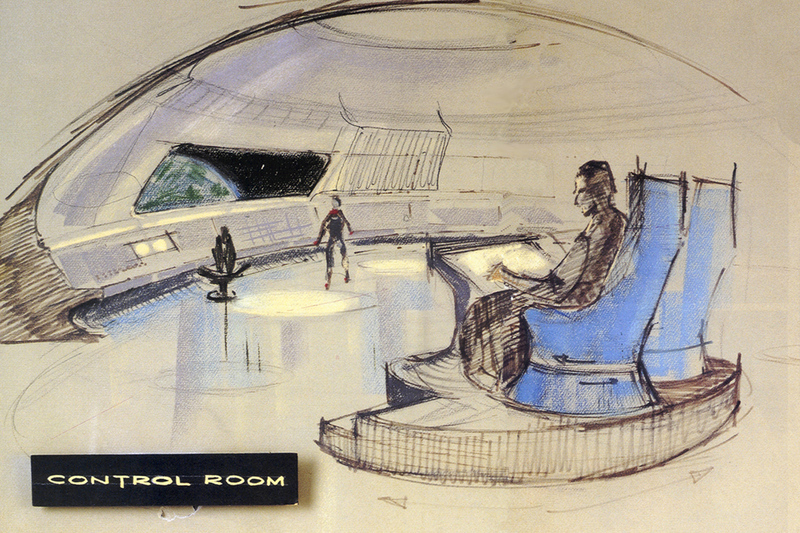 I'd forgotten that we don't actually see the door behind them in this early concept sketch. Maybe they were keeping their options open? I note that chair and platform both rotate. Crazy filming alignments! Slightly off topic, but notice how spacious that early Guzman concept is. This fits in with a theory of mine that the bridge on the early 540 ft ship was intended to be in the round superstructure that would later become the teardrop shaped B/C deck superstructure on the 947 ft version. But even at the 540 ft scale, the round superstructure would have been slightly larger than the final bridge dome. So it was only when the change was made late in the design phase to a teardrop shaped superstructure, that the smaller uppermost dome became the preferred bridge location (due to the planned "zoom in shot") and a smaller bridge was -at least temporarily- considered, but was rejected in favor of enlarging the overall scale to 947 ft. I would assume that all starships would have fore, aft, ventral and dorsal sensors as well as the "lateral sensor array" that is referenced in TNG episodes. I do think the bridge dome would be a good spot for sensor coverage above the ship. Where some people have disagreed with me is the function of the sensor dish mounted on the forward section of the secondary hull. I have always thought that this was more of a passive array that would be used when active scanning would ether interfere with the data being collected or as a tactical advantage to not give away a ships location during combat. It could also be used in emergency situations when main sensors have failed. I've never liked the concept of the Bridge being on the top. That's just bad design IMO and a huge vulnerability. Having the sensor located their is also problematic vs distributed sensors that are redundant. In my Head cannon, all the "Domed Area on Top & Bottom" got turned into a giant Mess Hall with 360° panorama windows and a matching cafe on the opposite side. The Bridge would be buried in the hull somewhere. Considering anywhere in the rest of the ship is equally vulnerable when dealing with anti-matter weapons, near light-speed or FTL weapons; I don't think having the bridge be on top is that much of an issue. The bridge can be placed where ever the designers want. Physically the bridge is located about as far away from the warp core as possible and protected by the bulk of the saucer section. This would also apply to impacts at the fore end of the saucer itself. As we saw in TWOK , it makes much more sense to attack the secondary hull and deprive a ship pf power as opposed to simply wiping out the bridge. Of course Khan wanted to gloat so he did not press the attack but it would force an opponent to choose between attacking he bridge and perhaps losing valuable intelligence or attacking the secondary hull to effectively disable the ship. At the very least it does give an enemy captain a more difficult tactical choice. As we saw in "Day of the Dove" even if the engineering section was captured in a boarding action effective command and control could be maintained from the bridge. Being far apart, any boarding action would need to be ship wide to be truly effective. Storming the bridge would be difficult as it is small and there are few access points for an enemy to take advantage of. Of course there is also the danger of becoming trapped by this same layout but with intruder control systems in place this might be an acceptable trade off. Being at he center of the saucer section it is likely that the bridge would be covered by multiple deflector shields and is a relatively small target. The two most glaring weak spots on many ships , the warp pylons and the neck of the ship are far enough away from the bridge to protect command personnel in the event of catastrophic structural failure in ether of these areas. StarCruiser and David cgc like this. Yet in ST:Nemesis, the Bridge was easily blown out. in ST:ENT in that alternate time line, the bridge on the NX-01 was literally blown out and everybody killed. in ST:Generations, if the Klingons were smart, they could've crippled the Enterprise-D on it's first shot by targeting the bridge directly then slowly wreck the rest of the ship. Take out the brains of the ship, and the rest is paralyzed for a set of time before somebody takes control of the ship, leaving it very vulnerable. Blowing up the bridge is a temporary problem for a starship. The crew have multiple ways to control the vessel. Putting it anywhere else, if someone were to target it specifically, would endanger the whole ship by making the structure loss much greater. Bury it in the center of the saucer section? If they want it that badly, they'll core the hull, effectively destroying the ship anyway. Putting in the outer hull, in a way, also protects the ship if someone is spiteful enough to try to kill the head of the ship first. Blowing up a deck One bridge leave the majority of the ship intact and functional, and with most of the ship's crew still alive and able to run the ship from auxiliary control. engineering, or another alternative location. One does have to wonder whether taking out the brains of the ship would make any difference. Battles on Trek are run more or less on automatic: both sides go pew-pew, potentially but not necessarily maneuvering while doing so, and then one side wins. They actually ought to be run even more on automatic, taking the sluggish and indecisive human(oid)s out of the equation altogether, but what we see is fairly good, too. Do baddies aim at the hero bridge? Typically this happens very late in any given battle. The Duras Sisters might have chosen the secondary hull as their target because that does the most damage to the enemy. Or they could have tried to maximize surprise - hitting the bridge would require maneuvering before firing, and indeed the E-D always chooses to position its opponent on the underside of the saucer in the pre-combat posturing phase, potentially exactly because they want to use the saucer as a shield and to see how the opponent reacts to that. Shinzon hit the bridge late in a fight where he had the absolute drop on his enemy initially. Then again, he still hit the bridge too early, if he hoped to capture and make use of Picard and his supposedly all-important blood. Perhaps he was counting on the bridge being nigh-invulnerable, and erred on that? In TUC we saw a torpedo punch through the entire saucer, so even if buried in the middle of the ship it would still be a target. Galactic Alignment, StarCruiser, uniderth and 2 others like this. Exactly. It doesn't matter where you put the bridge, it's just as vulnerable. What could make sense is if the bridge could be detached and serve as an auxiliary spacecraft. We've never seen that on screen, but I believe EC Henry included that functionality into the Pacific 201. The impression I got from the description of Voyager's flyable bridge was more that it'd be the King of the Escape Pods after an evacuation, rather than the fanciest shuttle for the fanciest missions (though the latter seems more practical for a lower-budget situation trying to limit sets and shooting locations). StarCruiser and uniderth like this. Maybe the only reason for a bridge on the top or bottom, is for easy replacement. well it punched through two decks, would the same torpedo have been able of reaching the center of deck six? maybe not. during tos, kirk described sick bay as being located at the safest part of the ship, suggesting that some parts of the ship are safer than others. In both Nemesis and the Enterprise mirror universe the opposing ship so vastly outgunned Enterprise that I am not sure it is a fair assessment of a combat situation. The true brains of a starship is the computer core, not the main bridge and commend functions would be transferred to Aux Control as soon as the bridge was disabled. A warp-capable cylinder packed with matter and antimatter, with a destructive yield of 25 isotons (which could destroy a city ["Living Witness", VOY]), would get through several unshielded decks--if the first volley didn't take out a bridge buried in the middle of deck six then the second definitely would. Sickbay typically is in the safest place on a ship, but they too are susceptible to the dangers of space (Voyager's took heavy damage in "Caretaker"). No matter where you are, life on a starship is always going to be dangerous. I've always thought of Starfleet putting their bridge on top of the saucer as a sign of their optimism and faith in others, they go out in peace and expose themselves as a sign of trust. DanGussin and Henoch like this. ^And the Klingons put their bridges up front because they're just cocky SOBs.